I thought you would enjoy a war story. We deposed [John Doe] (ex-con, con-artist, general bad guy, etc.) two weeks ago. His attorney directed him to not answer most questions, stating any competent attorney knows that RICO claims cannot be brought in state court. I just love it when the big firms are certain that they know everything. The attorney has since changed his mind and is trying to determine what to do. Grell on RICO is great! I would like to thank you for your publication, Grell on RICO… Your writing is such that one can start to have a good grasp of RICO from the reading of the first several chapters… Your treatise is one of the few, if not only, treatise I have encountered in my search which makes RICO understandable. GRELL ON RICO is a practical guide to common claims and defenses arising under the RICO Act. 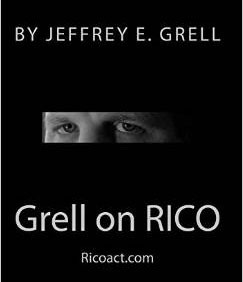 GRELL ON RICO includes all of the information contained on this website and more. Its 600 pages include edited court opinions, commentary, helpful charts and graphs, and the text of the RICO Act. Available in hardcopy or PDF. The textbook was last updated in October 2014. The book is also available on Amazon. Call 612-353-5530 to order a hard copy ($62.00) or PDF copy ($40.00). Shipping is approximately $10.00 for the hard copy. Credit cards accepted.